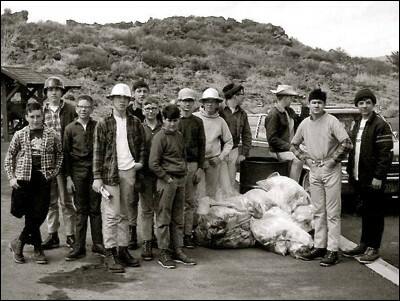 In April of 1967, the community service portion of my Eagle Scout project was to haul trash out of Captain Jack's Stronghold at Lava Beds National Monument. I organized the troop and we spent the better part of a day crawling through caves, and over lava flows.... I'm in front wearing a silver hard hat and holding a rolled-up map.